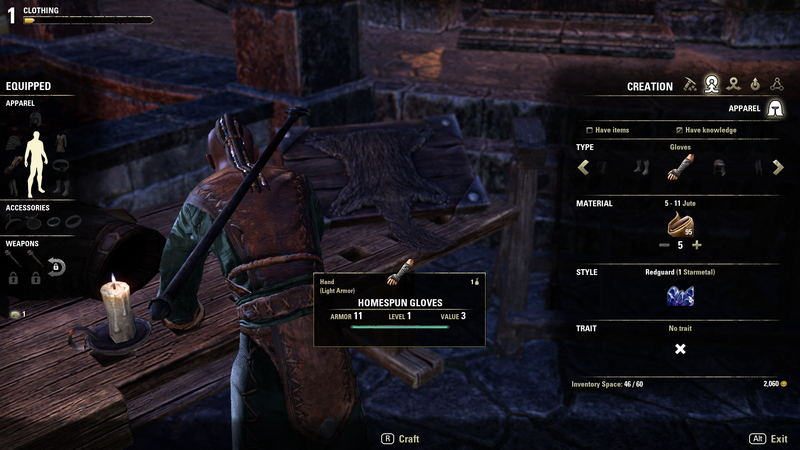 One of the systems I like most in The Elder Scrolls Online is the crafting. I am not a dedicated crafter in any MMO but I look forward to it as additional gameplay and I want crafting that is deeper than the gather, queue, and wait motif that games like World of Warcraft offer. 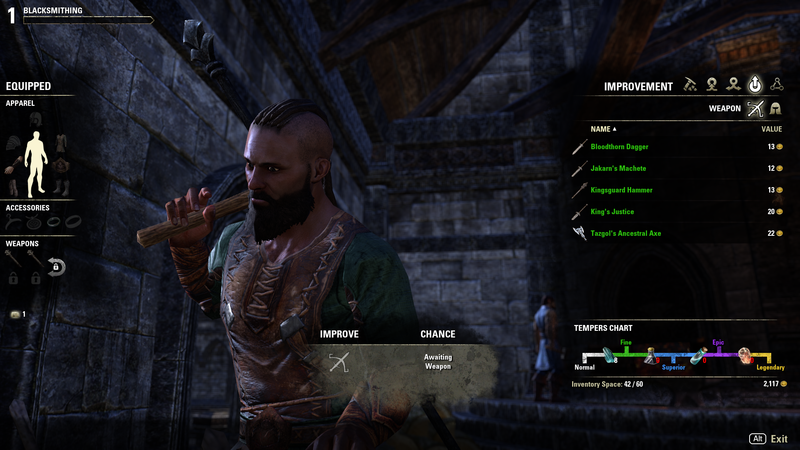 If you have never played ESO at all or if you did but have not tried crafting on a new character since update five I’ll be dedicating several posts to crafting from the beginner’s perspective over the next few weeks. Danel is kind of a jerk. This is his answer when I asked about the difference between crafting food and beverages. Thank you, Grand Master Obvious. Millenith on the other hand is quite pleasant, despite the fact that she looks like a possessed elven blacksmith from an unaired episode of Supernatural. 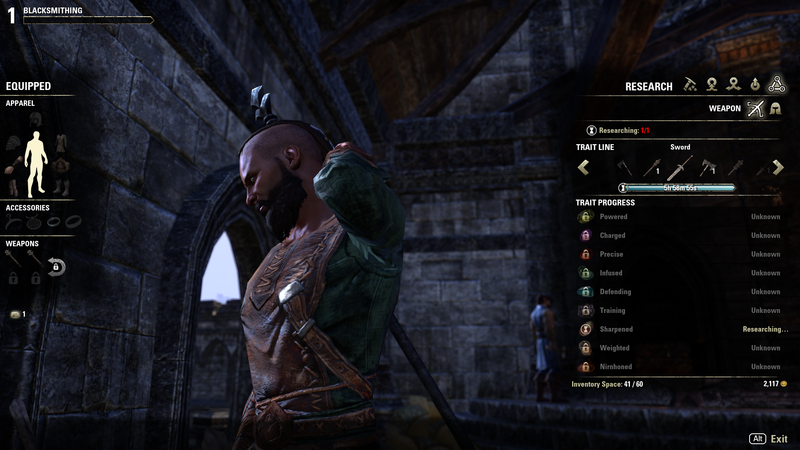 Crafting in The Elder Scrolls Online begins when you discover the fighter’s guild or mage’s guild for the first time in either Davon’s Watch, Daggerfall, or Vulkhel Guard depending on your faction. While the guilds have nothing to do with crafting, each one houses an NPC that starts the certification process for crafting writs. Introduced with update five, writs are crafting dailies for the six crafts in ESO. Each crafting writ can be completed once daily after you hit level 6 and the certification process serves as a tutorial. Millenith is waiting for you at the fighter’s guild and will certify you as a blacksmith, carpenter, and clothier. 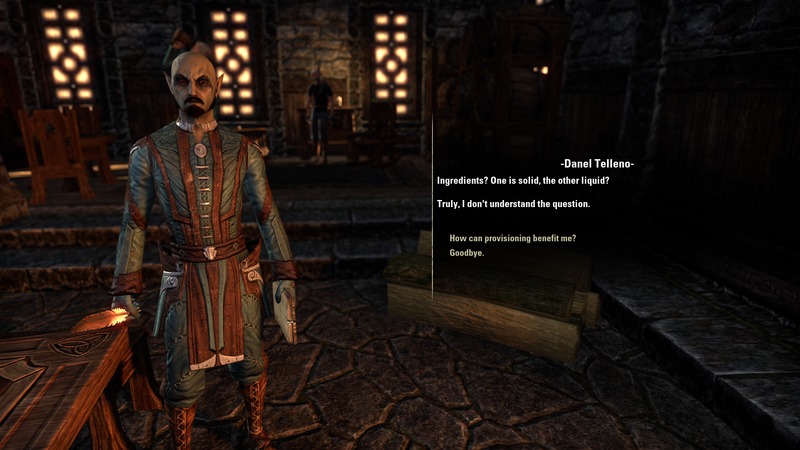 Danel Telleno will certify you in alchemy, enchanting, and provisioning and can be found at the mage’s guild. Each certification requires a simple quest chain that will walk you through the basics and you can work on one certification per NPC at a time. After initiating the writ certification quest you are directed to an area near the city where you can harvest the relevant materials. Every player can gather all materials and some of them you need to collect are difficult to identify until you’ve seen them at least once. Writ certification gives you an opportunity to see the nodes for the first time when they are marked on your mini map so you know what to expect. Later on if you chose to focus on a particular material to gather you can use a skill point on a passive that will cause a glowing mist to appear over the nodes as you approach them but until then the writ quests will help you identify what you need to gather by its appearance. Once you’ve collected your materials you will return to the city and meet either Danel or Millenith at the respective crating station for whichever writ you are certifying. For now I am going to focus on Millenith and the fabrication crafts. Whether you chose carpenter, blacksmith, or clothier your first step will be refining the raw materials you’ve gathered. For example, if you begin with the blacksmithing profession you will refine your raw iron into iron ingots. With the refining process complete, Millenith will ask you to craft your first piece of gear. 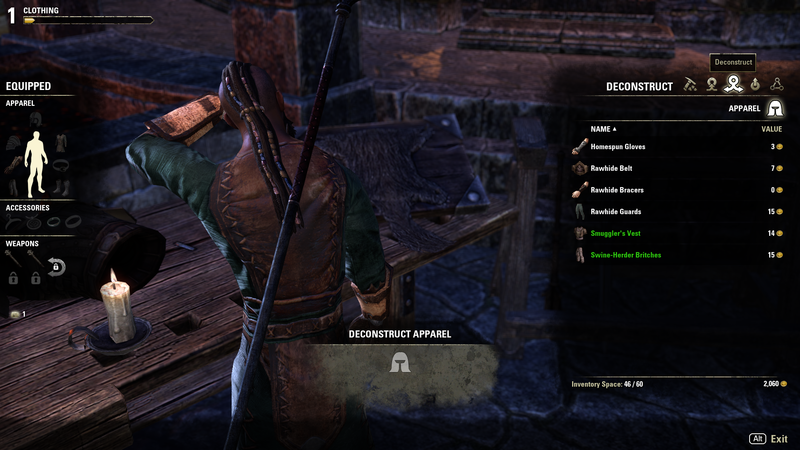 Crafting in ESO is very different from the system in World of Warcraft and similar games. Here you have several ways of tweaking an item before you create it. Thankfully the UI and accompanying tutorial are more than enough to get you started without problem. First you choose an item to craft by scrolling left or right at the top of your menu to find the weapon or armor piece you want to make. If you have the correct materials you will then have the option to increase the amount used in order to craft a higher level weapon. So a simple dagger for a level one character may only require 2 iron ingots but if you’d like to make it usable to your level 8 Nightblade you can increase the iron amount until the weapon’s level matches your own. After that you’ll need to select a crafting ingredient specific to your racial style. At first you will have to craft your own race’s gear but from what I understand you will eventually be able to find motifs that allow you to craft in the style of other races or you can purchase them from other players. I’m not sure how rare the drop is but if you are into crafting, collecting these motifs provides a sizeable endgame focus. If you like to adventure you can try and collect them in the open world or you could make money from crafting and use it to buy additional motifs in order to make even more money through crafting. With eight races (in addition to your own) and seven pieces of gear there are a lot of style motifs to collect. Next, traits can be applied to crafted item. However I don’t know much about this aspect of crafting because I have yet to use it on anything I have made. What I do know is that I can take gear and use it to research traits which can eventually be applied to a crafted item of the same type. Each item has nine possible traits to research that can change the effectiveness of enchantments, increase spell resistance, improve the speed at which you level up weapon skills, or a number of other buffs. However researching a trait on one item does not allow the use of that trait on another item. For example with carpentry there are five weapons that can be crafted, each with nine possible traits. That’s forty-five traits you’ll need to research for wooden weapons alone. Later you will also have the option to upgrade the quality of your crafted gear to uncommon, rare, epic, etc. This is not necessary for certification but it is helpful to know for later on when you want to make something for your character to use. The upgrade is applied after the item is made and each tier requires a unique ingredient. For every single use of the required ingredient you gain a 20% chance to upgrade the item. If you want a guaranteed upgrade you will need 5 of the upgrade ingredients. You will not receive enough early on to craft a full set of green quality gear, but you will have plenty to craft one or two items to fill any holes in your gear set. Once you have crafted your first item, return to Millenith. She will inspect what you’ve made and then ask you to deconstruct it, a process by which you take the gear you no longer need or cannot use and turn it into materials for crafting. I love it when games add this to the crafting system, it gives you a meaningful use for all the gear that would otherwise be vendor trash. When you deconstruct an item you have a chance of getting the base material, racial style ingredients, or even the materials required for upgrading gear. However inventory management is a problem in this game so I destroy all of the racial ingredients that do not match my own, knowing I can purchase them from a crafting vendor later when I get the required motifs. Don’t cry Fahd’ali Azim, you can always make another one! Once you’ve deconstructed your first piece of gear you will be able to complete the quest chain with Millenith and participate in the daily crafting writs. I have found that by casually gathering while I level I do not come across enough basic materials to do the writs every day but enough to do them a few times a week. After completing your first certification, Millenith will ask if you would like to begin another. All of the fabrication professions work as I have just described, so it simply requires repeating the process but with different materials. By the time you have completed all three you will feel very comfortable with crafting gear in ESO. I’ll stop there for this week, but hopefully you can already see that whether you are serious about crafting or only want to participate casually the system has a lot of potential. You can keep it simple and still be able to provide yourself with the gear you need as you level or you can make crafting a focus for your gameplay and there will be enough choices while making gear to keep it interesting and enough traits to research and motifs to gather to keep you occupied. 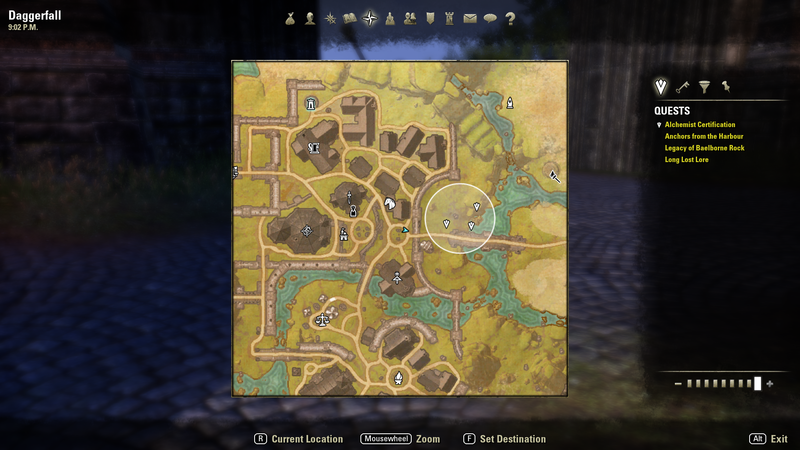 Between the user-friendly UI and the approachable tutorial getting into crafting in ESO is simple even if the process is not. Next time I’ll take a look at crafting consumables—alchemy, enchanting and provisioning. Each one is a little different so I’ll try to walk through how each one works as much as I can. Thank you for your response! This is by far the most visited post on my blog, especially since the console launch of The Elder Scrolls Online last week and yet you are the first person to ever write a comment. I really appreciate feedback and interaction with my readers so thank you. When I was in high school (I’m in my thirties now) I had a lot of Mormon friends; the LDS church in our community was quite large. Because of that I did a fair amount of reading on the doctrines and practices of the Latter Day Saints to help me understand what my friends and their families believed. There were some similarities to my own evangelical Christian upbringing—I always respected my friends’ commitment to the moral teachings of the bible and their emphasis on family—but there were also significant distinctions. Firstly, I believe in the deity and the eternality of Jesus Christ. “In the beginning was the Word, and the Word was with God, and the Word was God. He was in the beginning with God… And the Word became flesh and dwelt among us, and we have seen his glory, glory as of the only Son from the Father, full of grace and truth” (John 1:1,2,14). In the context of this first chapter of John, “the Word” is in reference to Jesus Christ. He is fully God and has always been. Secondly, and intimately bound to the first, is the purpose and consequence of Jesus’ death on the cross. “For in him all the fullness of God was pleased to dwell, and through him to reconcile to himself all things, whether on earth or in heaven, making peace by the blood of his cross” (Colossians 1:20). The sinless Jesus Christ, because he was fully God, was able to serve as a substitute for sinful human beings, receiving on our behalf the punishment for sins. The blood sacrifices of lambs from the Old Testament pointed to this; that Jesus Christ would serve as the perfect lamb and by his death would take away the sins of the world. The law was given to human beings not so that we would try to follow it perfectly, but so that we would become painfully aware of our destructive imperfection and propensity toward sin. “For by works of the law no human being will be justified in his sight, since through the law comes knowledge of sin” (Romans 3:20). Instead, by faith in the atoning death of Jesus Christ, we are able to be forgiven for our sins, not because of what we have done—which will always fall short—but because of what Jesus Christ has done by dying on our behalf. “But now the righteousness of God has been manifested apart from the law, although the Law and the Prophets bear witness to it—the righteousness of God through faith in Jesus Christ for all who believe. For there is no distinction: for all have sinned and fall short of the glory of God, and are justified by his grace as a gift, through the redemption that is in Christ Jesus, whom God put forward as a propitiation by his blood, to be received by faith” (Romans 3:21-25a). What this means for a follower of Jesus Christ, is that our confidence for forgiveness, freedom from sin, a repaired relationship with God, and deliverance from the penalties of sin lies not in our own religious practices or in a strict adherence to the moral law, but rather in the gracious gift of God to accomplish all those things solely on the basis of what Jesus Christ accomplished on the cross. Paul writes in the book of Romans, “And to the one who does not work but believes in him who justifies the ungodly, his faith is counted as righteousness” (Romans 4:5) and again in Ephesians, “For by grace you have been saved through faith. And this is not your own doing; it is the gift of God, not a result of works, so that no one may boast” (Ephesians 2:8, 9). Does that nullify the moral law? Absolutely not, instead it establishes a foundation for living according to the law by the power of the Holy Spirit for the glory of Jesus Christ rather than on the basis of our own will for the sake of our own merit. “I have been crucified with Christ. It is no longer I who live, but Christ who lives in me. And the life I now live in the flesh I live by faith in the Son of God, who loved me and gave himself for me” (Galatians 2:20). All of this combined paints a very different picture of who Jesus Christ is and of how we, as sinful human beings relate to God from the picture portrayed by the Mormon Church. While I wanted to acknowledge your comment and share my appreciation for your feedback, I also wanted to share with you (and anyone else who happens to read this) the fundamental differences between Mormons and Evangelical Christians; they are not negligible. I hope you continue to read my blog, and if you have any questions on anything I’ve written I will do my best to answer them. I would also encourage you to read some of the books of the bible I’ve referenced: the gospel of John, Romans, Ephesians, and Galatians would all be beneficial in further understanding the beliefs of evangelical Christians. Elegantly written, Ironweakness. Like many others, I stumbled upon your blog while searching for ESO crafting tips. Rest assured, I found the information I sought here in your post and for that, I thank you. However, I also gleaned some unexpected and most welcome food for thought. Having read through the comments, I now find myself inspired and uplifted not only by your beautiful explanation of OUR faith, but also by the gentle grace with which you addressed your reader from the Mormon Church. Yours is truly a Christ-like response that demonstrates an attitude of humble respect. If evangelical Christians around the globe would strive, in every encounter, to treat people of other beliefs in this honorable manner, the world would be revolutionized for the Kingdom. God bless you. Thank you for pointing this out; I’ve added the option to subscribe via email now. You should find it at the top of the sidebar on the right of the web page. If you are on a mobile device you may have to scroll to the bottom to find the follow information.